Pax 3 Vaporizer vs Firefly 2; Which one is best portable vaporizer? Let’s review both with in-depth comparison. People have always wished for a device, which allows for discrete vaporization and fits quite comfortably in the pocket, which is exactly what Pax 3 Vaporizer offers. It looks almost similar to its predecessor, but has more innovative features and some upgrade in its hardware. The firefly 2 vaporizer on the other hand is an on-demand pure convection vaporizer, which is capable of producing the best quality of vapor that you can get from a portable vaporizer. It also has some quite amazing features and specs, which makes it a worthy competitor of the Pax 3. Both Firefly 2 and Pax 3 Vaporizer are portable device that you can bring anywhere. Pax 3 is a conduction vaporizer, which means that the material is baked by the dry herb chamber itself. It works best if you have enough time to relax and enjoy the vaping experience. It is compatible with both dry content and concentrates, having three different lids to cater for your preferences. Firefly 2 on the other hand, is a convection vaporizer, which means that the chamber does not directly hit the dry herb. It has a heater underneath which is responsible for drawing air that heats the dry material and extract it. It makes the best choice for a quick session, especially if you do not have enough time to vape for a full session. You can get your session going in as little as 3 seconds as there is no waiting for the chamber to heat up. Unlike Volcano vaporizer, both Firefly 2 and Pax 3 are compact and travel friendly. Firefly is known for its amazing vapor quality, and the Firefly 2 is not an exception in any way. it produces smooth and consistent vapor with both concentrates and herbs. Its glass chamber and borosilicate glass vapor path do an excellent job in ensuring you get clean and aromatic vapor. The mouthpiece is located away from the chamber, which means that the vapor will never be too warm and the mouthpiece does not get hot. Pax 3 also gives quite impressive quality of vapor. Given that it uses conduction, you may have to wait for about 40 seconds as your dry herbs cook up, but the wait is always worth it. You get clean crisp vapor that is of very high quality. Both Vaporizers come with smartphone applications, which can come quite handy. The apps allow control of temperature, switching between concentrate and dry herb modes, etc. They also give you a customized experience, which makes you feel like you can truly connect to your device. the applications for both are available for Android and iOS platforms. Both are available at Free Shipping, so no need to worry about delivery charges. Comparison of Pax 3 Vaporizer and Firefly 2 gives you clear idea about their unique features. Next thing is to refer certain thing before you buy any vape device. There are quite a number of things, which you must consider when buying a portable vaporizer. Some of the main ones include temperature range and control, looks and feel, battery life, size of the heating chamber, heat type, warranty, and size. Ploom offer Pax 3 coupons to get it at discounted price. Both Pax 3 and Firefly 2 are great options that offer amazing vaping experience. Making the decision is depended to personal preferences in terms of heat type, and other features, as well as price considerations. You can try eliquid from Five pawns if you want different taste. 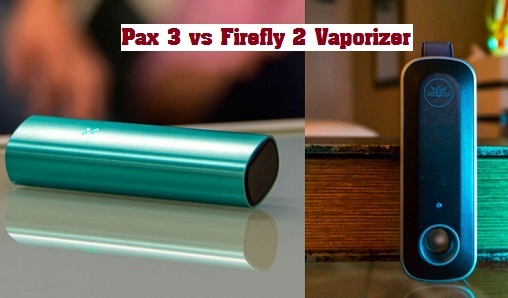 If you have any queries here about Firefly 2 vs Pax 3 Vaporizer comparison and review then please comment here.